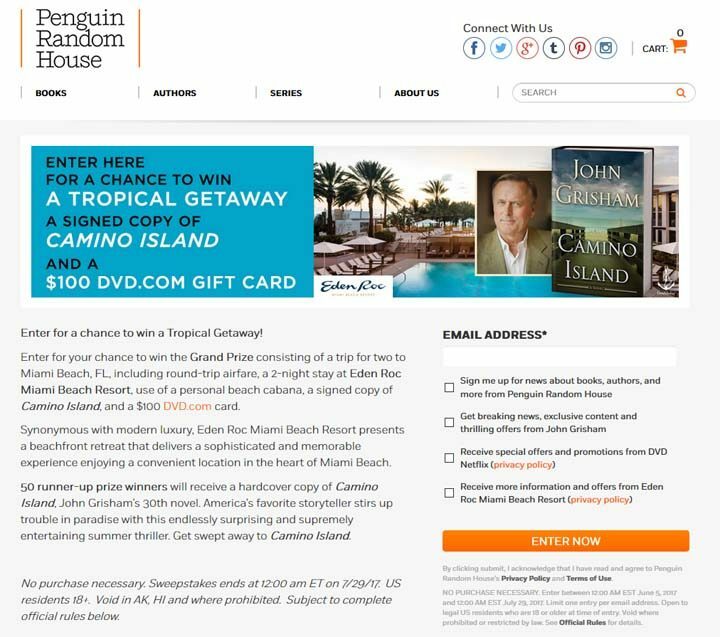 The John Grisham Camino Island Sweepstakes is open to legal residents of the 50 United States and the District of Columbia, who are eighteen (18) years of age or older. The John Grisham Camino Island Sweepstakes ends at 12:00 AM EDT on July 29. To enter the Sweepstakes, go to CaminoIslandSweeps.com and complete and submit the entry form. The Sweepstakes is limited to two (2) Entries per day, one (1) entry via email address and one (1) entry via social media per day. ONE (1) GRAND PRIZE: Grand Prize consists of a three (3) day, two (2) night trip for Grand Prize Winner and one (1) guest to Miami Beach, Florida including round trip coach class air transportation for Grand Prize Winner and Guest from a major commercial airport nearest Grand Prize Winner’s residence to Miami, Florida, two (2) nights hotel accommodations at the Eden Roc Luxury Hotel in Miami Beach, use of a personal beach cabana for duration of trip.one (1) signed hardcover copy of John Grisham’s Camino Island, and a $100 DVD.com gift card. The ARV of the Grand Prize is not to exceed $2,628.95. FIFTY (50) RUNNER-UP PRIZES: Each Runner-Up Prize consists of one(1) hardcover copy of John Grisham’s Camino Island. The ARV of each Runner-up Prize is $28.95. The ARV of all prizes is not to exceed $4,076.45. I need a tropical vacation, tired of clouds and rain.